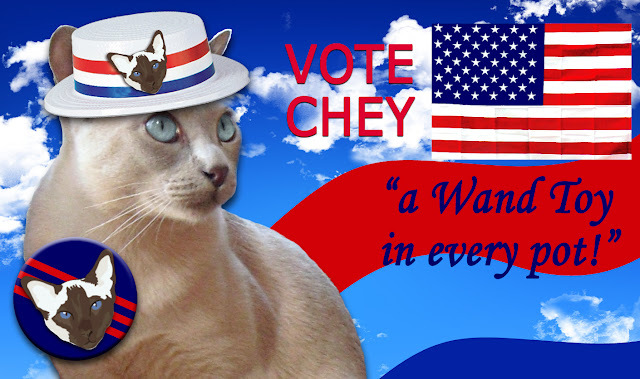 As you may have heard, Zee & Zoey are hosting the Campaign for a Cause to name the next Cat Ruler of the World. Now we know what you're thinking...and yes, cats already pretty much rule the world anyway. Guys, this is a fab campaign! So it's with great excitement and anticipation that we three kitties leap into the fray. And, knowing us...well...we can't agree on ANYTHING. BIG NEWS: Chesuli asked me to be her Campaign Manager! At first I was a bit worried by her slogan, "One Cat to Rule Them All" but then I decided that it probably meant she was endorsing one cat per household to rule the humans, and I'm totally down with that. *modest look* That slogan was all my idea, don't you think it's pawesome?!? Purrfect Pals in Arlington, WA. It's where Ichiro came from and where Chey's human, Bonnie, volunteers. 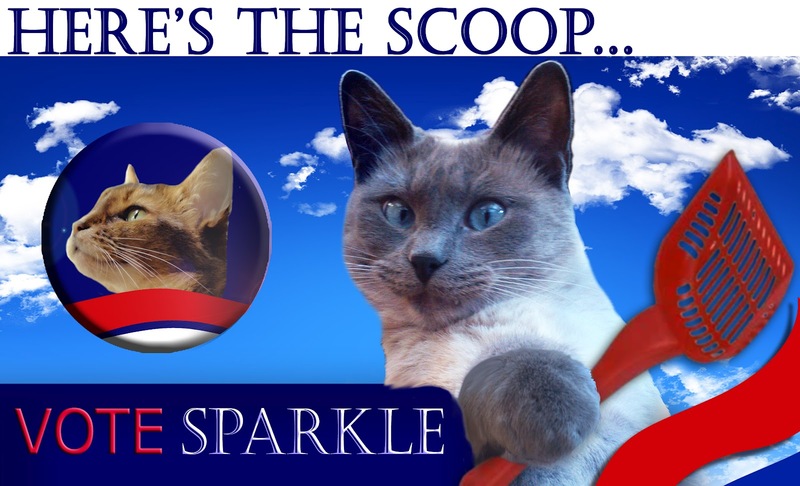 Since, as a deaf kitty, I'm considered special needs, I offered my support to Sparkle for her campaign for Tabby's Place. At Tabby's Place, all kitties have something that makes them less adoptable, whether it's wobbly cat syndrome (cerebellar hypoplasia), paralysis, FIV or stomatitis (hey, I have that, too!). And well, let's be honest, Sparkle kind of intimidates me...so I figured I'd kind of better support her! But Allie doesn't agree with our choice of cat-idates. Psst! 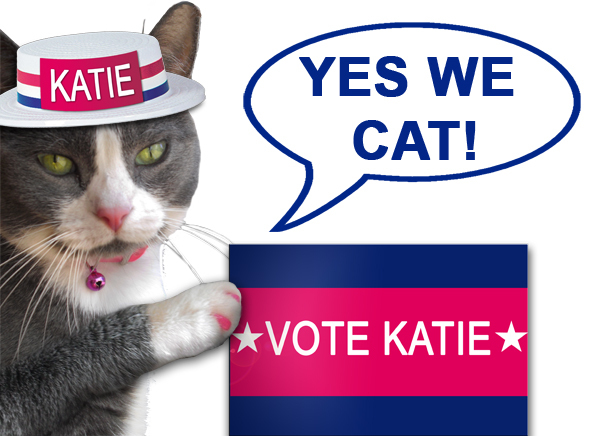 A vote for Katie is a vote for Blind Cat Rescue! And contrary to what some kitties think *glares at the Brats* I am not shallow. I'm not just supporting Katie because her campaign is PINK. Well, that might have been a factor. AND some good bling once in a while. But seriously...Katie's shelter, Blind Cat Rescue, is very worthy of your support. They currently have over 90 kitties they've given shelter to, and if they find a forever family, great. If not, this is their forever home. And they're even working to build a second structure to house blind kitties that are FeLV/FIV positive, too! **UPDATE: A Tonk's Tail just discovered they finished their second building and are now able to help FIV/FeLV kitties too! on Sept 11, Get Out The Vote! You are right, whichever catidate wins, kitties in need will benefit. Let's get out the vote! Mom is thinking about donating to all the shelters these catidates are supporting as our contribution. You three will have to draw wand toys to see who gets to click the vote box. No matter who...in the end, it's the shelter kitties that will win. And that will make us ALL smile. We will be out to vote. Have a terrific Thursday. I can only imagine what our household would look like if I weren't in the running myself! Thanks for your support Maxwell! BTW, that is great news about the new FeLV/FIV building at Blind Cat Rescue! Way to go Allie! *paw bump* If you stop by my place, I've been featuring the kitties of Blind Cat Rescue the past few days. It's all about the Cause! Hmmm, yous is ALL supporting a different cat and that your house can only has 1 vote, Maybe yous might vote for someone different! However, me thinks all the places should wins, so whoever does - deserves it! I love Blind Cat Rescue and you can bet I'll be voting. We wish they could all win! Sparkle...Katie...Chey... Any of these beautiful ladycats would be an excellent choice. Although the "A Wand Toy in Every Pot" got Harley's attention! We are all divided up about who ta vote for too! Things could get a bit hissy iffen TBT makes us all agree on a single candidate. Well, another interesting turn of events and points that had to be made. I am so very relieved that we will not be voting at our household as it would not be fair to all the great Cat-idates we are endorsing, but wow... that's a lot of cat opinions in your house to deal with!!! !